Junk removal is our art! Just point us to your junk, and we will lift, load, and cleanup for you. Our truck teams are ready to attach unwanted construction supplies, remove debris, and pull down anything you deem useless. Our truck teams are friendly, welcoming, uniformed and well organized. We go further to offer other commercial services such as real estate cleanouts, management of property and more. Basically, we are prepared to make any environment clean. Our cleanup professionals are determined to save time by cleaning as fast as possible, efficiently and without breaking your bank. Our hardworking team ensures all your cleanup is done so you can focus on what matters the most. We not only clean your space, but we also haul away and recycle where necessary. As long as it fits in our huge trucks, we will pick it up, and your environment will be fresh and clean as new. If you are looking for junk removal Minneapolis then search no further. We specialize in real estate and residence clearing. The useful items we get from there are recycled or repurposed. We also donate for reuse. This is to impact the society positively. Our charges depend on the space your junk needs on the truck, not hours or the weight involved. 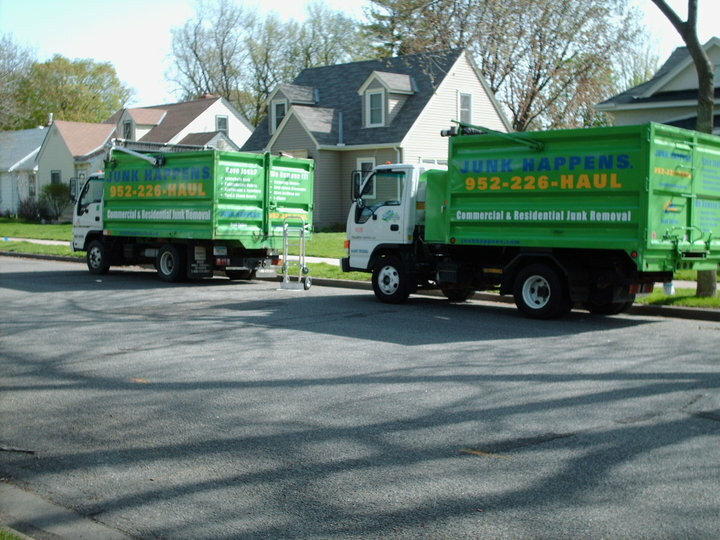 After loading the truck our junk removal service Minneapolis stops at donation and recycling centers. We strongly believe in renewable resources and a safe environment. We will save you the trips to and from dumpsites as a result. We understand that a tidy and organized construction location is safe for the workers and beneficial to the property owner since work will be efficiently completed. We also know that you don’t like the hassle of getting permits to do the dumping yourself, which might destroy lawns and driveways. Others will make several trips to get rid of junk, but we clean before and after renovation or construction with minimum trips possible. By calling our commercial junk removal Minneapolis, you save time and energy. We focus on both residential and commercial junk removal projects. It is cost-effective as we offer cheap junk removal MN. We work quickly and make sure your location is thoroughly cleaned. We recycle as much as possible with efficiency. When we leave your site, we leave with every unwanted piece of junk. Our teams work as fast as possible so you can focus on more pressing issues. How Much You Charge for Junk Removal Minneapolis? ur pricing includes labor, disposal fees and extraordinary customer service. There are no hidden fees; however, MN state solid waste taxes and surcharges may apply for certain items. What Are the Junk You Can’t Handle?